WE CAN STAIN YOUR DECK TOO! Deck staining if done properly can make your deck look new for a long time to come however it is not always easy and it’s usually better to hire a professional. 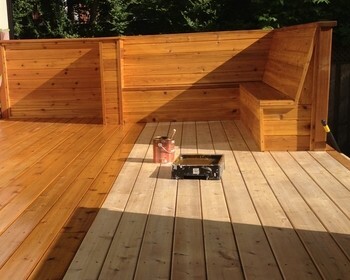 Let The City Painters help you with you next deck staining project in Toronto. We are very experienced when it comes to decks and deck staining and will help you find a product that will provide you with the look you want as well as the durability that a deck needs. We can also replace any boards that are rotten or require replacing. Call us today and let us take the hassle out of staining your deck. Matthew was so helpful when it came to picking a product to use on our deck. He walked us through all of our options and brought over colour samples. It made the process very easy. Your team was great and we are very happy with the way everything looks. I really appreciate you coming on the weekend to finish our work because of the weather. CONTACT US FOR A FREE PAINTING OR DECK STAINING QUOTE TODAY! Make sure you follow the steps below to properly stain your deck. Cleanse– Your deck surfaces should be cleaned properly prior to the application of any deck staining product. Normally, power washing the surface should be enough to clean it however if you notice any mold or mildew, you may want to find a cleaning product that you can add in. It is very important that the deck is completely dry before the stain is applied. Choosing the stain– There are a variety of stain options to choose from. Make sure that you understand the differences and choose a stain that works the best with your wood and that will give you the look you desire. Tools – Make sure you are using the correct tools for the job. Have a look at the stain you purchased and make sure you have the correct tools to apply it as different products require different tools. An extension pole is very handy when applying stain.